Roll out the red carpet — Mimi&apos;s coming through! 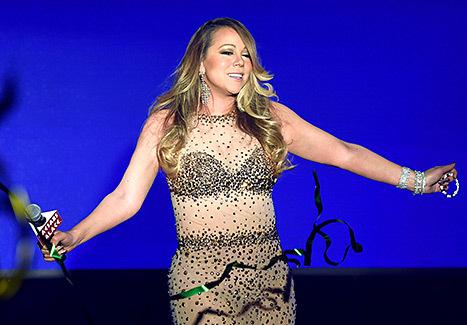 Mariah Carey made her grand arrival — in all of her bedazzled glory — to introduce her new residency concert, #1 to Infinity, on Monday, April 27, at Caesars Palace in Las Vegas. In true diva fashion, the Grammy winner wore a sheer gown covered in golden sequins. The single mother to twins Moroccan and Monroe, 3, opted for high glamour, accessorizing with a wrist full of bracelets, eye-catching chandelier earrings, and brown oversized sunglasses. Before she addressed the crowd of fans in Sin City, 18 advertising trucks rolled down the Las Vegas strip into the Caesars Palace, each one emblazoned with one of her song titles. Carey herself arrived in an antique pink convertible. "I feel very welcomed here," Carey said at the event. "This is just the beginning. This is a celebration of an album, eighteen number ones, a new album called #1 To Infinity, and that’s the name of the show here at Caesars." Following in the footsteps of stars including Celine Dion and Elton John, Carey added that she couldn&apos;t wait to perform for her fans. "I want to say I wouldn’t be anywhere without my fans. Thank you so much. Everyone loves Vegas. There is a new girl in town. You’ll be seeing me walking around. God bless and take care,” she said.